The game was Sega World Championship Socer II on the Sega Megadrive/Genesis. Here’s a screen shot of said game as I’m sure many of you have no idea what I’m talking about..or is that most of you? Unfortunately I don’t have any of the original graphics files for this title although there is a slim chance a copy resides on one of my old Amiga drives somewhere. Not to fear though as I have found a copy of the game on a ROM site and using that wonder of modern software technology known as ‘emulation‘ have taken a few screen shots for your delight and my own historical record. I didn’t do all the art, no no no, my partner in crime was ex-Graftgold artist John Lilley who created the title animation and the cut scene animations used throughout the game, with me providing all game sprites, backgrounds and menu art. Back then it was quite nice to work on something different, yeah yeah I know how different is one footy game to another? Well different with respect to the artwork and view. 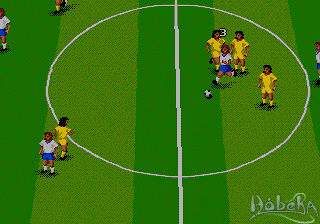 Let’s be honest the appeal of the original Sensi Soccer was the simplistic uncluttered ‘see all view’ of the game which lead us to adopt an almost icon like style for the sprites and pitch art. So the chance to work on a “secret” project that allowed me to draw big players and create some nice menu icons with lots of flags and formation icons was too cool for school. Looking back now through those warm retro loving eyes there is an obvious criticism I could make,”Why are all the players the same?”. If I recall memory was quite tight on the cartridge and to keep things within the code structure of the original game everything had to sit within the same framework, including the number of animations for the players and the way they were stored in memory. 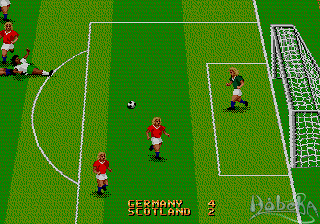 I believe this was to retain the same colour changing technique used on Sensible Soccer although I could be mistaken. I think you will agree the end result did the job, although the animations are quite crude for their size they work without being too clunky. I’ve recently learned that the blue box European release is actually quite a rare and sought after beast and has been known to fetch at auction as much as £750! Wow, unbelievable! Having recently played the game via emulation* it’s certainly worth trying it out but I would suggest bagging a joypad from somewhere as playing on a keyboard is not going to provide the same experience as using a proper pad. 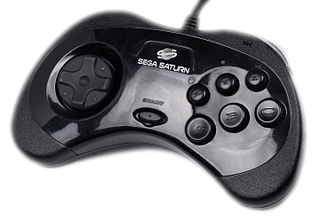 I’ve got a USB to Sega Saturn pad converter which for this game works brilliantly, especially with a Japanese Saturn pad as they feel great and are easily mapped to cover all Genesis pad functions. *I tend to use Fusion but Gens will do the job just as well.